Being one of the major cities in India, Hyderabad is home to many people and many vehicles. 3/4ths of the vehicle population in the city comprise of two-wheelers. With rising accident rates, the Government of India made it mandatory under the Motor Vehicles Act, 1988, for all vehicle owners to have a basic third-party liability insurance policy. Choosing a comprehensive policy which also covers own damages is optional. In order to make the insurance claims settlement process easier for all parties, insurance providers usually tie-up with garages across the country. If the policyholder chooses to repair their vehicle at one of these partner garages, then they can benefit from cashless settlements. The insurance provider will deal directly with the garage in matters of bills, invoices, and other documentation that is required. The insurance company will pay the bill and the policyholder will only be liable to pay for any part of the bill that is not covered under the insurance plan. If you wish to find a network garage, there a multiple avenues to do so. Note that every insurance company has a different network of garages. A list of network garages should be included in the brochure or policy document issued to the customer. Customers can contact the customer support team to get assistance on locating a network garage. Insurance companies have a garage locator on their official websites. A customer can enter their location and city to find garages nearby. Cashless settlements can make all the difference in the claims settlement process. The process is faster and smoother. A customer needs to intimate the claim to the insurance provider, after which they can take their bike to a network garage to get it fixed. By providing the policy number and other required details, the garage will file for a cashless claim and seek approval for the same. Once the approval is given by the insurer, the bill will be settled directly between the insurer and the garage. Customers are not required to go down to the insurance branch and file for a reimbursement claim. The claim settlement is done at the garage itself. Customers are also not required to collect all receipts and documents, make copies and provide the same to the insurance company. The garage will handle this and send the required documentation to the insurer. Customers are not required to shell out money from their own pockets. Out-of-pocket expenses are limited to only what the two-wheeler insurance policy does not cover. Customers may have to pay for any part of the bill that is not covered by the insurance plan such as depreciation on spare parts of the vehicles. There will be lesser hassles and the turnaround time for approval and claim settlement will be shorter. Since the garage and the insurance company are tied-up, much of the process will be shortened as the information of the garage is already held by the insurer. There is no particular insurance company that offers the best two-wheeler policy at the cheapest premium. Premiums differ between each person and between vehicles. Many factors come into play while determining the required coverage and the cost of the plan. When trying to find an ideal bike insurance policy, there are a few things to bear in mind. Your premium depends on a number of factors and the amount of coverage you choose. Insurance providers will take into consideration the make and model of the bike, the cubic capacity, the city of registration and purchase, the details of the driver and so on. To lower your premium rates, you can get discounts for additional safety features and so on. A comprehensive package will also cover own damages and injuries along with third-party liability. A third-party liability policy will cover only expenses incurred in damages, injuries or death caused to a third party involved in the accident. If you can afford the premiums, it is smart to choose a comprehensive package. A no-claim bonus is a discount awarded to customers who do not make a claim during the policy term. When a customer renews the two-wheeler insurance policy, the insurer will provide a discount on the premium amount. NCB is 20% for the first claim-free year and subsequently increases to 25%, 35%, 45% and 50% maximum. If your insurance provider offers cashless settlements, you will not be required to pay from your own pocket for the repairs. Opting for an insurance provider that offers cashless facilities at network garages will save you a lot of the hassle involved with insurance. The bill for repairs will be paid for directly by the insurer. However, you will be required to pay any part of the bill that is not covered under your insurance plan. Insurers will cover up to certain limits for third-party damages to people and property. Most insurers do not have a cap on the limit for third-party death claims, but for damage to property, the claims are capped at Rs.1 lakh. 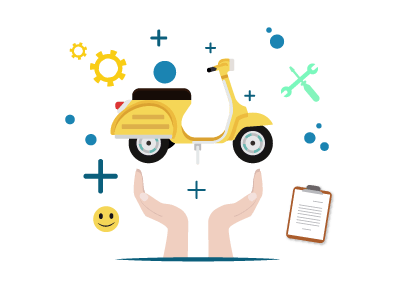 If you choose to sell your two-wheeler, there are a few formalities that you must fulfill. To make sure you are not legally obliged to any future liabilities connected to the bike, you need to hand over the necessary documents to the new owner and transfer the ownership name. You can also transfer the bike insurance policy to the new owner. You need to inform the Regional Transport Authority (RTO) of the sale of the vehicle and apply for a No Objection Certificate (NOC). If you have not made any claims on your insurance policy, and have accumulated a no-claim bonus, you can apply for a no-claim bonus certificate. The no-claim bonus certificate will ensure that the bonus is in your name as it is non-transferrable. If you apply for a fresh insurance plan for a different vehicle, you can then avail the no-claim bonus on that policy. If the new owner fulfills the eligibility criteria of the existing plan, the insurance company be willing to transfer the policy to the new owner. After the new owner provides the necessary personal details, the policy will be transferred. Transferring the insurance policy can fetch a better price on the vehicle. Apart from this, it saves the new owner the hassle of getting a new policy, and you the hassle of closing the existing plan.